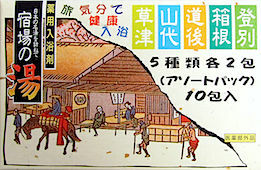 Shukuba no yu (宿場の湯) by Nihon Detergent (日本合成洗剤), a company from Osaka. As the name suggests, their main forcus is household detergents, but they also make a wide range of other products from toiletry to cosmetics. This is an assortment pack trying to take you on a trip to famous hot springs in Japan, but they’re not trying to reproduce the water of those onsens. Should help fatigue, cold, dry skin. The box contains 10 sachets, 5 kinds, 2 of each. This is basically the same concept as the clear pack of Tabi no yado, but I think it is less great. These have a weaker smell, less pretty colors, although the box is nice, and it would still make a great little gift for someone who hasn’t tried any. On the positive side, it’s cheap, I got this for $8, which makes it 20% cheaper than the Kracie one. This time I’ll skip the onsen introduction if it is known from other packs. I forgot some ratings. I’ll write about Dougo in the next Tabi no yado pack, the rest was covered, except for Yamashiro, which is located in Kaga City, Ishikawa Prefecture (on the Sea of Japan coast, Japan’s Mid-West), and opened 1300 years ago.